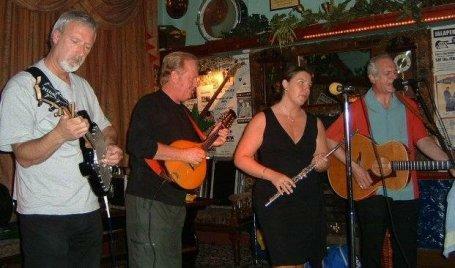 This is a very professional 4 piece Ceili Band,excelling in Irish Ceili music,songs and dance. They are available as an Irish concert band (without caller).But,with their caller,can provide a very versatile night of dancing and fun, whether your taste is for English,Irish,Scottish or,even,American ! Joanne is a professional musician who has played the flute from the age of 7, has a formal music education and also plays saxophone and keyboards.And on the flutes,she can play virtually any style of music ranging from Irish through Country to Rock and Roll! Ken is a self taught professional musician who started playing flamenco style at the age of 18 and later graduated to mandolin, mandola and banjo as he became interested in Irish Traditional Music. He has played as a session musician and with various Irish and Folk bands and has a unique mandolin style. Just gotta hear him play his Sobell mandolin ! Alan is a professional musician who can play various instruments from guitar to keyboards.He has played with several bands ranging from Folk Rock to a top flight Ceili Band and he is an accomplished tunesmith whose knowledge of Irish tunes is unsurpassed. Barrie sings and plays loud-one (Louden) guitars.As a professional musician, Barrie has played on the folk and country scene for many years and is acknowledged as having one of the greatest and varied repartees in the business. And if you want a fiddle,in addition,for American Hoedown,they can easily oblige ! VERY versatile. Add in their top quality and self- contained Dynacord PA and Bose speaker system (covered by Public Liability Insurance and Electrical Equipment Safety Certificates) you are talking about a band that areÂ willing to play 7 nights per week throughout the UK !! Highly recommended. The various price categories reflect the band's willingness to travel and whether the band perform as a 4 piece or 5 piece band plus caller.So it's best to ask for an actual quote.